yarn isn’t the only thing that arrives on my doorstep when i’m not home—i received a couple of nice books during my absence as well. this one by JC briar—charts made simple—is especially appreciated, because it fills a gap on the reference shelf that’s been too long standing. JC is a talented tech editor, teacher, and designer who describes herself as a technique junkie and whose classes are offered at virtually every large-scale knitting event (i’ll be seeing her soon at sock camp and the loopy ewe spring fling, in fact). i really love the simplicity of this book—its black and white interior layout highlights one simple concept about chart reading on each page or spread with minimal text, thus allowing each statement to have importance and space. it’s just the format a learner needs to become a skilled chart reader, one step at a time. while my friend clara parkes has explained very well why a book about chart reading is necessary, i’d like to tell you more about the book itself and why THIS book is the one you want. JC begins at the beginning with basic chart reading concepts, explained simply and precisely, then builds on those concepts step by step as she proceeds through the book’s contents. 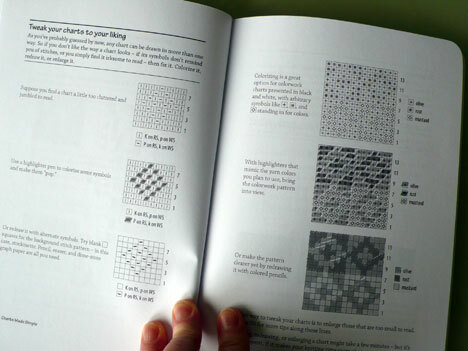 and guidance for reading/marking charts in a manner that is aligned with your actual knitted fabric. 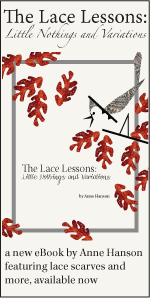 many times when i teach lace classes, we get into a discussion of chart reading and why it’s a good skill to acquire. we are able to do some skillbuilding in class, but not in the depth this book allows. 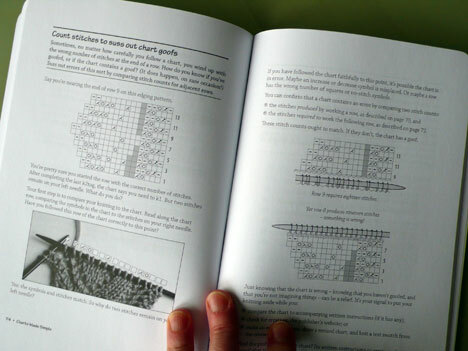 i like the detailed way she matches the chart to the knitted fabric in this example of a broken chart, which is typical of examples throughout the book. like i said—step by step—it’s brilliant! and finally—my personal favorite—charts that move from side to side or those for which the round marker moves at some point. **newsflash**—if the sight of that page spread made you gasp, you need this book (you won’t be sorry you bought it). if you think you can never learn to read charts—think again; with a book like this, you can. the way it’s set up, you can start with the basics and put them to use, then go back to absorb new bits as you need them. 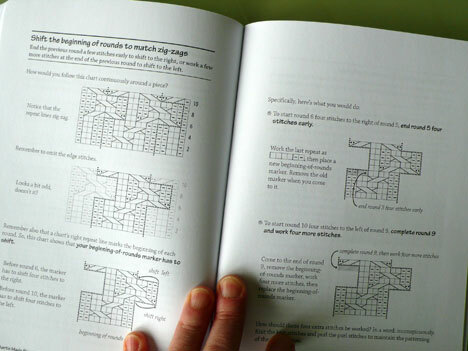 experienced knitters will want this one too, for learning more about the complex charts related to advanced knitting projects. this would also be an awesome book for any teacher to read as well; even if you’ve seen everything at least once, finding a way to explain it to others can be challenging and a guidebook can help you formulate that material for classes. 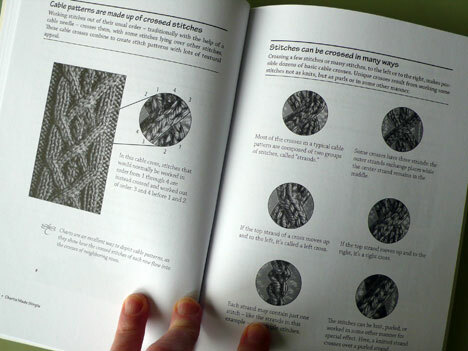 best of all, it appears that this book is just the beginning of what i hope will be JCs “knitting on paper” series—we can only hope there are more of these clear, concise guides to help unravel the mysteries of knitting. now here’s the very funnest part—JC has offered to send a copy of charts made simple to one lucky winner. leave a comment at the end of this post between now and 9pm EST on saturday, 2/26. we’ll pull a name randomly from that pool and announce the winner on sunday or monday morning. 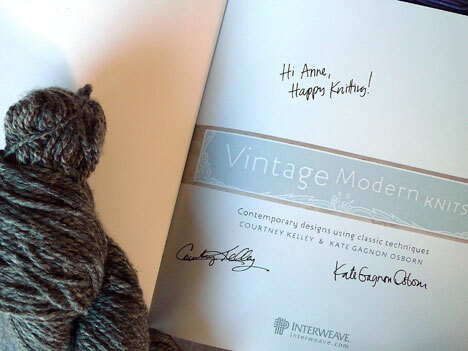 vintage modern knits, by courtney kelley and kate gagnon osborn, who are the driving force behind kelbourne woolens, distributors of the fibre company yarns (that’s a skein of fibre company savannah, photographed with the book). i’ve known kate and courtney for a couple of years now, since they first flagged me down at TNNA to say hello—i’ve always like them so much and their aesthetic really appeals to me. 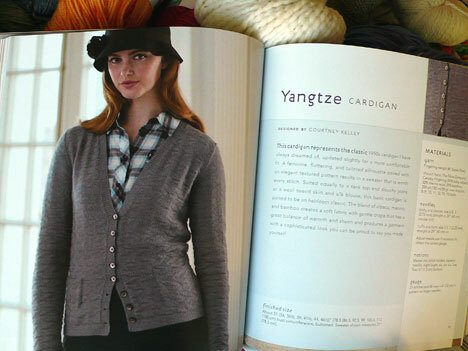 this book of vintage-flavored modern designs assembles garments and accessories that feature a variety of classic knitting knitting techniques. 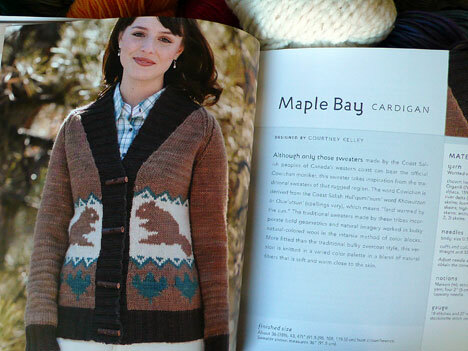 although everything in the book is photographed on a model, i can picture each and every one of these pieces on kate or courtney too—you can tell these pieces were created to be comfortable and wearable for actual working knitters. 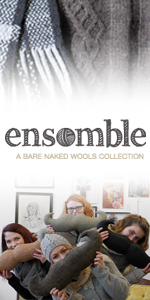 what i mean by that is that the garments included are wearable for everyday, both around the house or out in the world—anywhere—AND they put all of our favorite knitterly skills to work in the making. so that when you’re done, you’ve got a garment you enjoyed creating and one you are proud to wear. from sweaters to accessories, the design choices and styling are wonderful—familiar enough to call comfortable, but smart enough to be part of a working wardrobe. and then there is this—i really, really want this. or i might want to knit it for david. i wonder if he’d wear it? the best part?? i got my book signed—thanks you two! 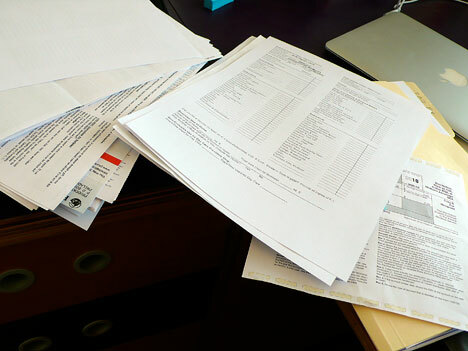 meanwhile, back at the ranch, i’m wading through the last stages of catching up with paperwork—completing my tax organizer, ugh. i told myself that i had to get this done before i was allowed to look at any pattern work or new knitting. so i’m plowing through it. thanks to everyone for your patience while i get things back in order here—it takes a while after a big trip. the good news is that i do have a little time for actual knitting at night and i’ve managed to complete a couple of projects. the mink/cashmere scarf, infinity version, is done, blocked, and sewn together. and i love it. the pattern is waiting patiently for me to get back to it—sorry. i know you want it, i do. there is just so much time in the day, though, you know? it’s funny, the days have virtually disappeared this week and i know what the culprit is—email, haha. i’ve spent too much time attending to that and not other things. i’m going to have to set limits so i can get my other work done. oh, and i have more knitting . . . a nearly-completed inky dinky sweater and hat. i have to explain that i haven’t mentioned the yarn used in this project because it’s an older, long-discontinued superwash yarn. it’s very nice and i love the color, but there’s no point mentioning the name, since it’s not available anywhere. the sweater just needs the underarms seamed and a nice steaming. i have to pick out buttons; not sure if i have something on hand that will work, but probably—a plain shell button should work nicely and i have a ton of those. 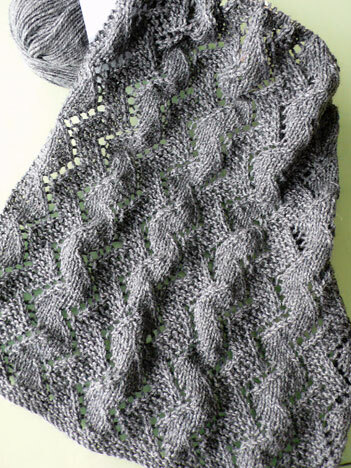 i’ve been taking my gray zig-zag lace scarf everywhere with me and knitting a few rows whenever i can. and guess what? it’s growing. 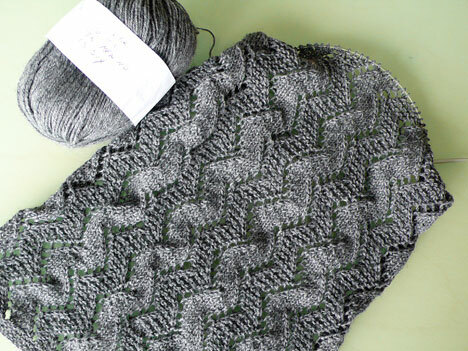 i love this classy charcoal gray blend of yak/mink/merino/soy from great northern yarns; it’s knitting up so lovely in this stitch pattern. this would be a nice lightweight scarf for a man, but i’m keeping it for myself—i think it will travel very well and take that sort of abuse in stride (craig’s yarns are great that way; they just don’t pill). i like the contrast between the two stitch patterns in certain light; that shaded effect this is most clearly visible in a smooth, multi-ply yarn such as we have here. i have the matching shawlette on the needles too, but it’s waiting patiently for me to devise a hem chart. i’m so behind, yikes! with that in mind, i’m going to return to my tax work so i can finish up and move on to patterns. tomorrow we have a new release that i think you’ll like—something you’ve been waiting for, yay. 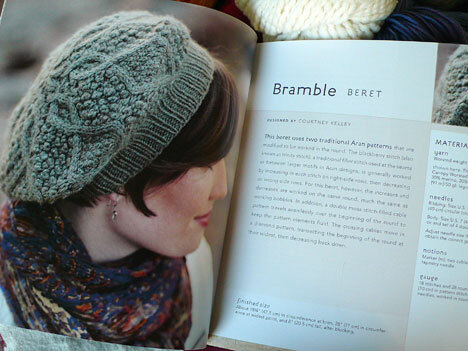 what wonderful reviews for new books, ones you most def want to have in your knit collection! Oh, My! 400 comments, and I really need this book. I can’t do charts, and I love lace. Pick me, pick me!!! anne–love your blog and your designs! thank you for offering this gift to your readers. 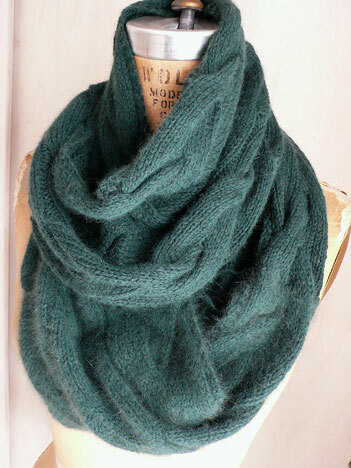 I also had to buy Vintage Modern Knits when i saw their sample knits at the Blue Purl on the NJ Yarn crawl last weekend. Bought some of their yarn and already started on the eyelet shawl! 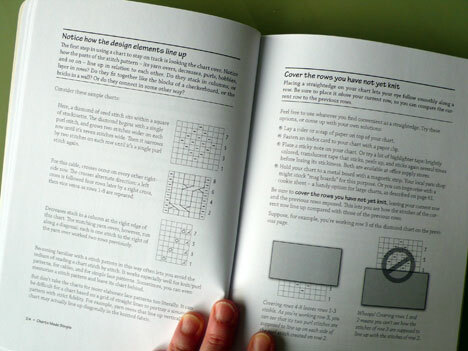 I would love a copy of the Charts Made Simple book!!! Please enter me in the drawing. I have a close friend who would greatly benefit from this book…I would love to gift it to her! I am struggling with some charted cables at this very moment. JC’s book just might stop me from pulling out my hair. 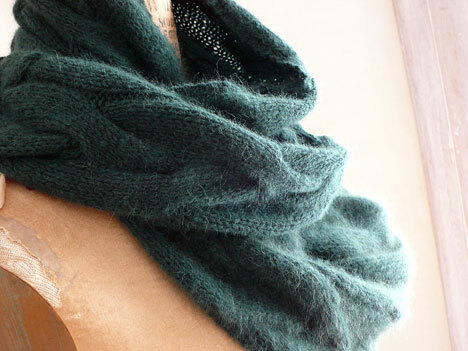 Love your new mitts with the pleated hem, Anne. What an awesome book! Will have to buy it if I don’t win it. 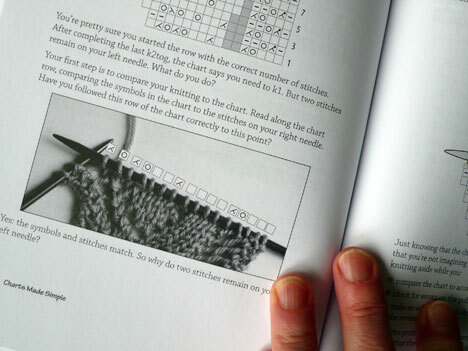 As a beginning knitter who just knows that charted knitting will be in my future, would love,love,love to win this book. Of course I’ll join the lottery! What a great book! If I don’t win it, I am definitely buying it ASAP!! Oh my I need this book!! I would love to win this book!! Fingers (and toes) crossed – should I find my lucky charm bracelet? Charts always scare me, so it would be great to have this reference. The tips and tricks sound very handy too, thank you for the review! Wonderful looking book. Thanks for the review. I love your thoughts on these things. I loved your book reviews. Thanks for the chance to win!! I love your blog. I learn so many things here. I would love to win the book on reading charts. I am very interested in learning how to use them. 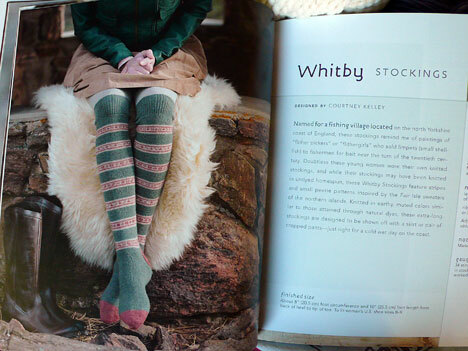 I love the charting book and would read it and then give it to my daughter who is about to start knitting her first sweater – she knits great socks. If I don’t win the book, I will definitely be buying it! Sounds like a wonderful book. I could put it to good use! I think I love the book… even more I love the gray scarf. Very pretty pattern. I’m throwing my hat into the ring. This book sounds great and it’s out of stock on Amazon. Crossing my fingers! Wow What a great book! I have been knitting for a long time, but that puts a nice clear spin on what I just do. I find the other book very interesting as well. Projects are really great too! 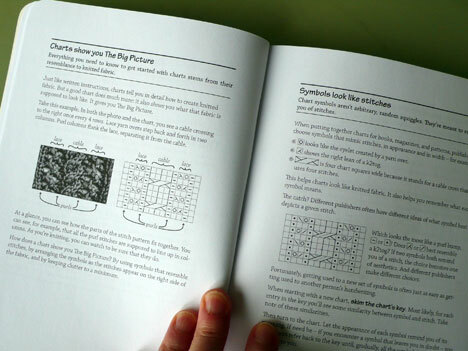 Perhaps this book can help me stop messing up the lace I am currently working on. 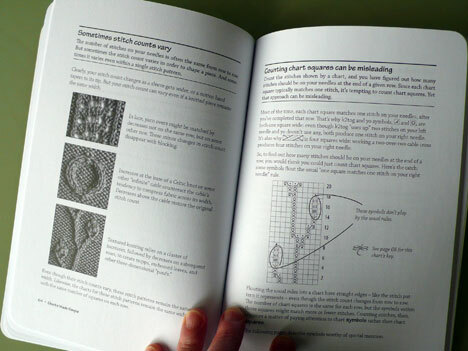 As a beginner lace knitter, it looks like it would be a great resource. What a fabulous book! I’d love to win a copy. You sure have been busy! Thanks, also, for sharing the pictures of your trip. Wow I would love this book! I’d love a copy of the book. 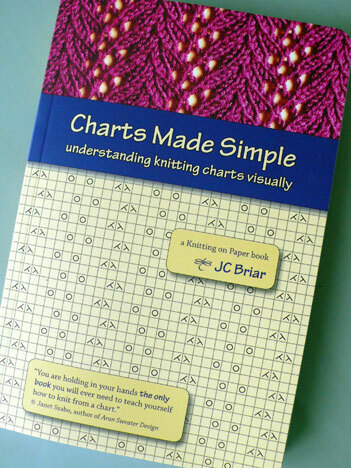 I’ve been afraid to try using charts in knitting, but having this book will certainly be helpful. Who wouldn’t love getting this book free?! It’s already in my cart though in case that doesn’t happen. Thanks for showing so much of the book; it shows that it is a book worth buying. What an awesome idea for a book! 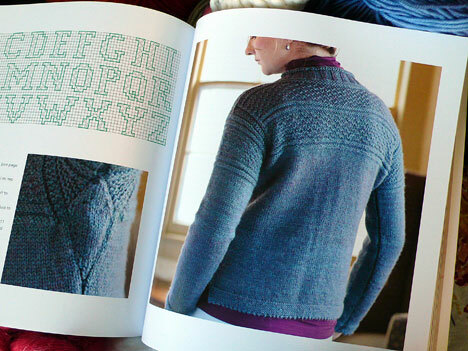 With all the lace knitting I do, it would be a great addition to my knitting library! Charts TERRIFY me! I can follow a written pattern just fine but whenever I have tried to read charts I have massive FAIL. The few items I have been compelled to make that did have charts I actually wrote out row by row. This book looks like one I will have to get. 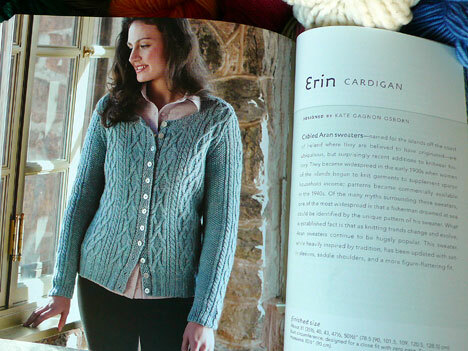 Thank you for the chance to win a copy, there are so many of your designs I would love to knit yet charts have held me back. With the space on my knitting bookshelves dwinding rapidly, I feel like I have to be picly about what books to buy. So, I love to see everyone’s book reviews. This book looks like an awesome one to have, though. Thank you for the book review. I am fascinated by the more complex lace charting. I am fairly new to chart reading and think this book would be a great addition to my library. Thanks for having a giveaway and giving us a chance to win the book. Thanks for your reviews and the chance to win a copy of the book on chart reading. Your zig-zag scarf is lovely. And that cowl–yummy yum yum! Without your review, I might not have given Charts Made Simple a second glance. Now I will definitely check it out! I have been searching all over for a good “chart” book…I can’t believe you have one and its EXACTLY what I’ve been looking for!!! 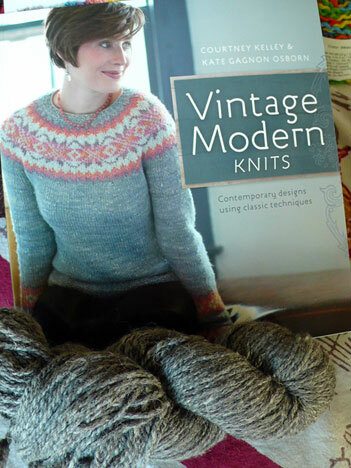 Also, I just picked up a copy of Vintage Modern Knits this past weekend. Whooo! Love your designs…all of them!! Both books look excellent! Thanks! Enjoy your website immensely. Love seeing the yarn, the colors, the travel photos, the works-in-progress, the finished items. It makes me want to knit. The charting book sounds wonderful. I have done some work from a chart. It grows on you! I am so glad that this book was written. I haven’t used charts because I find them so confusing. It’s like reading another language! Thanks for letting us know it exists, Anne. Once again, I learned something by staying up with your blog. Glad you’re back. 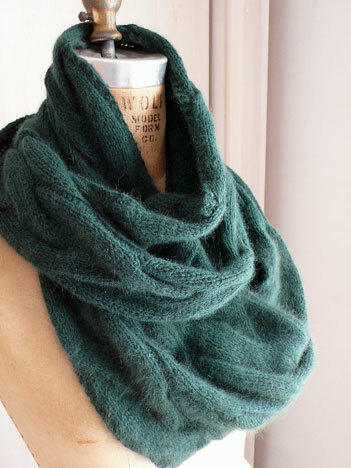 PS Can’t wait until the new mink/cashmere scarf pattern is released! Love the new mitts. this books looks wonderful. 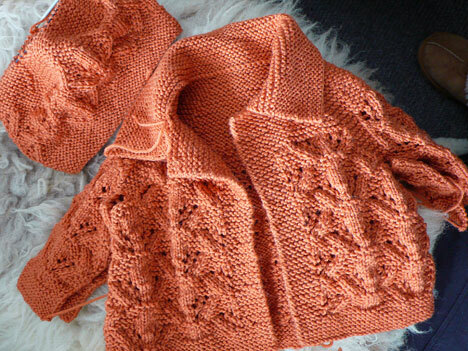 I love lace knitting. Thanks for offering one.